Two trends I’m noticing out there as we’re coming around the corner to fall, and they have all sorts of possibilities. One thing about being a sewists is that when you catch a trend like this on the upswing you can be right ahead of the curve. Most of the stuff out there now is VERY expensive cause it’s a new trend – in another 3 or 4 months, the price will come down a little, but this trend should be good through this coming summer – that’s about the life of a trend. 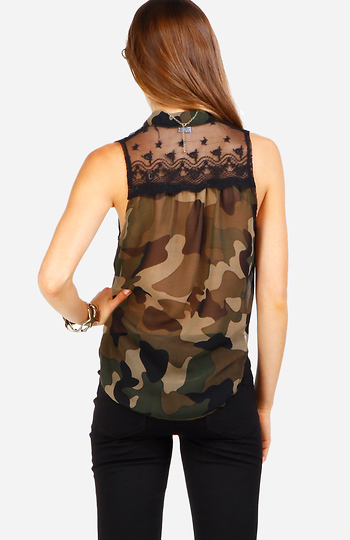 There are three things working here – lace, see-thru and camo. The lace & see-thru stuff is easy to grasp and easy to do. It’s also easy to combine – we think of these as pretty much a together type thing. But mix camo in there? Hmmm…now that affords us some possibilities. This is lovely Valentino espadrille at $595 and you too can have one….but let’s have some fun here. Here’s a great idea for a combination that works. If you’re not into see-thru/lace this much, then use it around the collar area. Notice the bodice is a see-thru too. Here’s some ideas on how to do the see-thru camo with some other fabrics. This is just a quickie search over at Spoonflower – and the neat thing here is that you can order this in cotton, satin, cotton voile, so you can have see-thru, with opaque all in the same print and color matching too. Spoonflower is deadly. But also you can order fabric that is trending right now which means you don’t have wait for it to get in the shop. If you just want to get some say in a satin – then make a nice tailored shirt, with lace trim. (Remember my old fav shirt Simplicity 2339 would be great for this). AND if you REALLY want to make it couture, get enough camo that you can match it in front – talk about killer great. Gorgeous Fabrics has some, Vogue Fabrics Store has some, Fashion Fabrics Club and I’ll bet if you go on your favorite online source, they all have it….it’s a hot fabric now. The whole idea here is to mix something totally masculine (camo) and primitive with something totally feminine and erudite….lace and see-thru. No self-respectin’ guy would be caught dead in a see-thru camo – well, OK if it was mesh and he was in the desert or something like that, but certainly not lace!!!! So for my money, mixing satin camo with some lace in a very tailored design would be so killer great looking. There are gobs of combos here, and while you’re steaming thru August, you can start creating a look for your fall closet that is ahead of the curve, and ahead of what’s available in retail! Ever since I tried on a vintage 1950s black lace dress at my favorite vintage shop, I’ve been wanting to make a vintage-style lace dress. I’m thinking of layering one color of lace over a different color — say, black lace over light pink fabric, or hot pink lace over black fabric, etc. I just can’t do camo though!